Historically, following a traffic ticket, if you failed to appear in court, or failed to pay court-ordered fines and fees, your driver’s license would be suspended. This applied to both criminal cases and civil traffic cases. If you were then cited and prosecuted for driving while your license was suspended, you would have a misdemeanor conviction, you would owe additional fines and fees and your license suspension would be extended. Many Arizonans found themselves in a never-ending cycle of driver’s license suspensions and mounting court debts. Arizona drivers can now use digital license plates rather than traditional physical plates. After more than a year of testing on Arizona Department of Transportation fleet vehicles, LTE network-connected digital plates that display messages such as "stolen" or "invalid" to alert drivers and authorities of illegal driving will be available for others on the road. ADOT spokesperson Doug Nick has previously described it basically as an iPad that goes in place of a traditional plate on the back of the vehicle. Dubbed Rplate Digital License plates, the devices are available via auto service providers or plate manufacturer Reviver Auto. In Arizona, cops can’t legally stop a driver for not wearing a seat belt, adults can text and drive in most places, and motorcyclists aren’t required to wear helmets. These and other lax road-safety laws make Arizona one of the most dangerous states in the country for drivers and passengers, according to a new report by the group Advocates for Highway and Auto Safety, which is funded by insurance companies as well as consumer and public health groups. Over the past year, Arizona has made scant progress in addressing this dearth of laws to protect drivers and passengers. 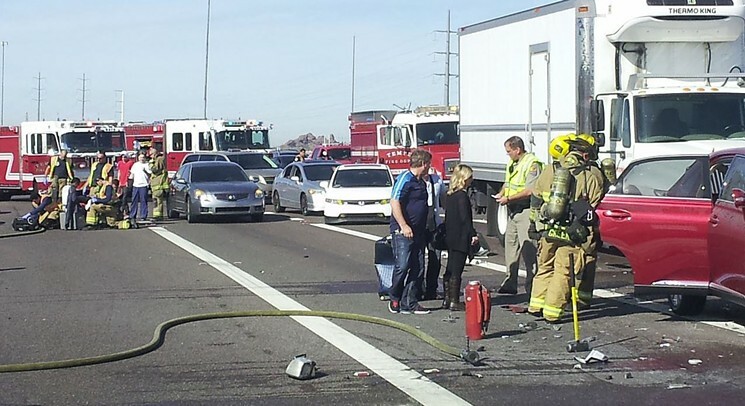 In 2017, 1,000 people in Arizona died in motor-vehicle crashes, according to the report — up from 962 deaths the year before. Tally up the last 10 years, and the death toll rises to 8,631 people. Meanwhile, crashes cost the state $4.183 billion each year in lost productivity, medical costs, property damage, and other consequences, the group calculates. Those, of course, are merely the tangible costs of the loss of human lives. After fighting the issue in court for years, Gov. Doug Ducey has agreed to issue driver’s licenses to all deferred-action recipients. In an announcement Wednesday, the state Department of Transportation said anyone who has an Employment Authorization Card issued by the Department of Homeland Security is entitled to a state license to operate a motor vehicle. The action came as Ducey gave up trying to appeal a 2018 ruling by U.S. District Judge David Campbell that the state was required to issue licenses to everyone the federal government has allowed to remain in this country. It also came years after the U.S. Supreme Court rejected the state’s ill-fated bid to keep “dreamers” — those brought to the United States illegally as children — from being licensed. A new national report says Arizona is falling behind in creating new driving safety laws and that new laws could have saved about a tenth of those who died on state roads in 2017. Two days after an Uber driverless car hit and killed a pedestrian in Tempe, someone used their own vehicle to try to run a Waymo vehicle off the road. It was about 7:20 p.m. on March 20, near Priest Road and Southern Avenue in Tempe. The Waymo driver, identified in a police report only as "Anthony," said a dark-gray, later-model Toyota Camry was tailgating him and driving "all over the lanes." As Anthony drove north on Priest and turned left onto Southern, the other car tried to force him off the road, he told Tempe police. As the Arizona Republic and New York Times reported last month, Chandler police documented more than a dozen instances of people attacking or threatening Waymo vehicles in 2017 and 2018. Whether angry, upset, or just bored, people have followed the autonomous vehicles, thrown rocks at them, slashed their tires, swerved toward them, and in one case even pulled a gun on a backup driver, as the Republic's Ryan Randazzo reported on December 11. In the latter incident, Roy Leonard Haselton of Chandler was sentenced in early January to a year of supervised probation. The results of a study ranking drivers by state in 2018 are surprising in light of the number of traffic-related fatalities that have plagued the valley’s roads in recent weeks. Since the start of 2019, the Las Vegas Metropolitan Police Department reports nine traffic fatalities, yet according to QuoteWizard, a website that helps consumers with their insurance, Nevada drivers rank sixth best in the country. According to the study’s webpage, QuoteWizard used incident data from the website’s users as well as fatality data from the Federal Highway Administration. The data specifically came from incidents categorized under accidents, speeding tickets, DUIs, citations and fatalities.